Who's the apple of your eye? This is Apple of My Eye from the Occasions catalog. 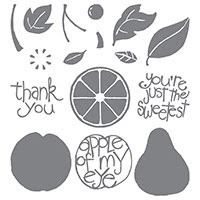 Look at all these cute fruit and sayings you get for $21.00. It comes in Photopolymer so you can see exactly where you're stamping. more practice with this technique! Both of these cards were inspired by cards I found on Pinterest. This is a great tool for inspiration! Just type in the name of the stamp set and you will see tons of great ideas. This stamp set will only be available for a few more weeks. Grab it today before it's gone!